Data from our pilot year showed that pollination (and thus pollinators) limit the number of tomatoes that a plant can yield here in Seattle. When pollinators were excluded (‘net’ in graphs above), plants produced fewer tomatoes than when pollinators were able to visit (‘nonet’). Furthermore, when plants received additional pollination with tuning forks (‘tuningfork’), they made even more tomatoes than when they were open to pollinators in the environment. 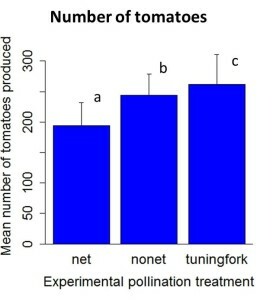 This means that regular tomato plants in Seattle are not producing to their full potential, and that this is because they are receiving a less than optimal number of visits from pollinators.Too few pollinator visits are limiting the yield of tomatoes (and perhaps other pollinated crops) in Seattle urban gardens. Similarly, we found a significant effect of pollination on the volume of tomatoes produced: plants that were open to pollinators in the environment produced both larger and more tomatoes than plants that were not. Being able to detect this effect was a little remarkable because we didn’t receive nearly as much data on volume as we’d hoped! We think too little data may be the reason that we did not detect a difference between the ‘nonet’ and ‘tuningfork’ treatments in terms of tomato fruit size, but we will hopefully find out in the 2013 growing season! Since we still detected these effects despite a smaller than expected data set (and despite the observation of some of our gardeners that the netted plants seemed ‘healthier’ than their other plants! 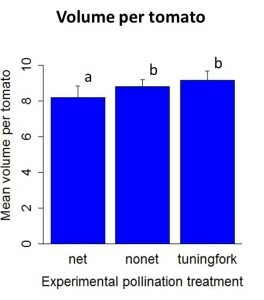 ), the effect of pollinator visitation on tomato number and size may be very strong! We also tried to get at the effect of P-Patch location on tomato yield and found that tomato production did differ between P-Patches… but, with the amount of data that we had, we couldn’t tell if that was because of the location of the P-Patch or because of the individual gardeners participating at that P-Patch. This means that we need more participants (replicates) per P-Patch to really be able to find out how location in the city affects yield!! Understanding how the environment around the P-Patch affects yield and pollinator abundance and diversity can help us figure out how to conserve the urban bees that enable us to produce sustainable food in our urban gardens, thereby potentially increasing yield. We did these analyses using a statistical technique called mixed effect modeling (fixed effects = experimental treatments; random effects = P-Patch location, individual gardener).